While motorcycle accidents are not necessarily more common than other types of accidents, they are more likely to result in serious injuries or even death. In 2016, 5,286 motorcyclists died in motorcycle accidents in the U.S., according to the National Highway Traffic Safety Administration’s National Center for Statistics and Analysis. One of the main reasons for the increased risk of death is that motorcycles lack the external protection and other safety features of a traditional passenger vehicle. At Greg Coleman Law, our licensed Knoxville motorcycle accident lawyers are committed to helping motorcyclists stay safe. They have prepared the following list of seven common types of motorcycle accidents. If you were injured in a motorcycle accident, do not hesitate to reach out to discuss your case during a free legal consultation. One of the most common causes of motorcycle accidents is illegal left-hand turns. Often, a motorist hits the motorcyclist who is traveling straight through an intersection. Motorists may not see the motorcycle because of its smaller stature or may misjudge its speed and try to turn in front of it. Head-on collisions are particularly dangerous for motorcyclists. The impact of this type of accident may throw the motorcyclist from the bike, causing him or her to crash into the pavement. Sadly, head-on collisions are often fatal for motorcyclists. If the motorcyclist survives, he or she may suffer life-altering injuries. Lane splitting is a driving maneuver in which the motorcyclist drives between vehicles between two lanes to move past stopped or slow-moving traffic. The motorcyclist may collide with a vehicle that suddenly starts moving because the rider has a limited amount of space and time to maneuver out of the way. Alcohol or drug use plays a significant part in many motorcycle accidents. The National Center for Statistics and Analysis reported that 25 percent of motorcycle riders involved in fatal accidents were under the influence of alcohol in 2016. Additionally, 37 percent of motorcycle riders who died in single-vehicle crashes in the same year were alcohol-impaired. Speeding plays a part in many motorcycle accidents. Even if the motorcyclist is driving the speed limit, accidents can still happen if the motorcyclist does not slow down when approaching corners or in inclement weather. If a rider is involved in an accident with another vehicle that was speeding, it can result in serious or often tragic injuries for motorcyclists who travel with limited protection compared to other vehicles. Road hazards are more likely to cause motorcycle accidents than passenger vehicle accidents. Smaller and less noticeable road hazards can directly impact motorcyclists, including pot holes, uneven pavement or sudden lane narrowing. Additionally, slick roadways caused by spills or rain can cause a rider to lose control of his or her bike. If you were injured in a motorcycle accident caused by another driver’s negligence, you may be able to recover compensation for your injuries. Motorcycle accident injuries are often very serious and require extensive medical intervention. The costs associated with these accidents can be astronomical. 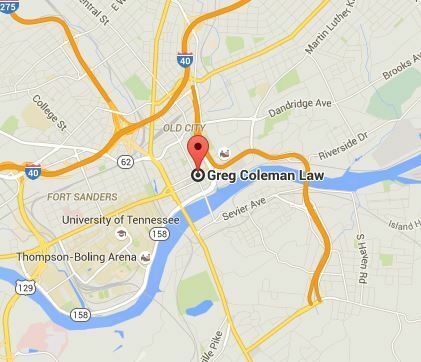 For these reasons, it is important to contact an experienced Knoxville personal injury lawyer from Greg Coleman Law. We can discuss your claim and determine your legal options during a free consultation. We charge no upfront fees. We work on a contingency fee, so we only get paid for our legal services if we successfully help you recover compensation for your injuries. Call us now at (865) 247-0080 or fill out our Free Case Evaluation form.